Economic Data for US Q4 GDP as forecasted by the Atlanta Fed ticked higher than last month to +2.6%, with strong employment and wage figures coming into play. In December, US employers added the most workers in ten months as wage gains accelerated and labor-force participation jumped. Nonfarm payrolls increased by 312,000, easily topping all forecasts, and November was upwardly revised to a 176,000 gain. Manufacturing payrolls also handily beat estimates. 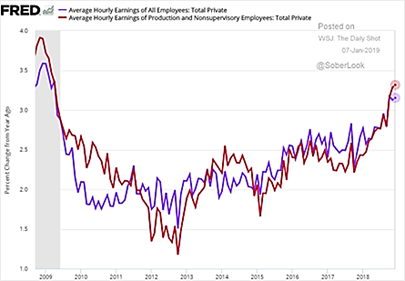 Average hourly earnings rose +3.2% from a year earlier (see right), more than projected and matching the fastest pace since 2009. The official unemployment rate rose slightly to 3.9%. Inflation still remains modest at 2.2% (both total and core) while industrial production beat expectations in November (+0.6% month-on-month versus +0.3% surveyed). Retail sales rose +0.2% in November, topping forecasts, after an upward revision to the prior month, Commerce Department data showed. Not All News Was Rosy as November’s pending home sales decreased -0.7%, and is down -7.7% from a year earlier on an unadjusted basis, following a downwardly revised -4.7% drop in October. 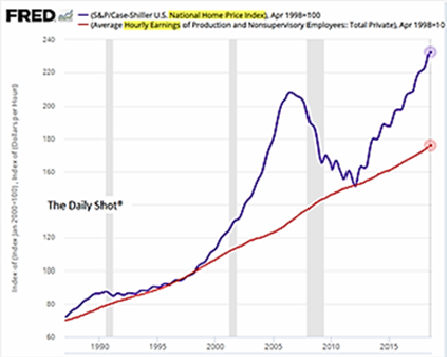 As the Federal Reserve’s graph to the left demonstrates, US housing prices still are outstripping the average hourly earnings of workers. How far does the gap have to be before a correction comes into play as in 2008. European Economic Expectations took a step lower with the median growth forecast at +1.6% for 2019, versus +1.9% in 2018. Germany (the largest economy) is expected to grow less than +1.5% with Italy (the third largest) at +0.7%). German industrial output unexpectedly slumped -1.9% in November in a broad-based decline led by consumer goods and energy. Year-on-year output was down -4.7%, the worst performance since 2009. Retail Sales at least grew more than expected in November at +1.1% versus the +0.4% forecasted. Finally, the ECB halted as expected its bond buying (QE) program though proceeds will be reinvested as the markets are seen as still weak. Slowing Chinese GDP growth appeared to be more likely as the various year-on-year economic indicators slowed (see graph near right) or missed forecasts – e.g., industrial production came in at +5.4% versus +5.9% and retail sales at +8.1% versus +8.8%. Inputs to these indicators show some large declines as well as direct foreign investment was -26.3% year-on-year and car sales down -16.1% year-on-year. 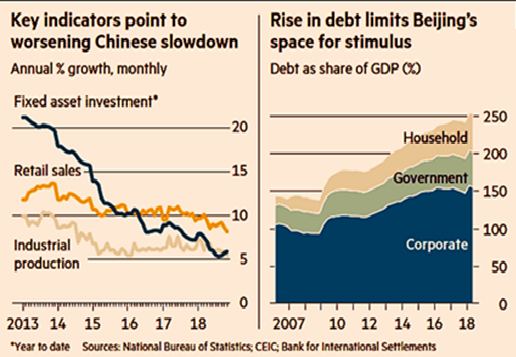 Looking at the graph far right, China does not have a lot of room to stimulate the economy given that debt per GDP grew monstrously from the last financial crisis in 2008. In short, China is as indebted as the US. There is room to lever further (for example, the Chinese central bank cut reserve requirements allowing commercial banks to issue up to about $117 billion in new loans) so no crisis this year is likely. However, rumors that a government agency internally projected 2018 GDP growth to be only +1.7% instead of the official +6.6% with +6.2% in 2019 persist. A slowing by China was felt in the region, with South Korea seeing a -14% decline in exports to China in December with semiconductor shipments down -8.3% year-on-year. Some argue that more aggressive lending is needed but with debts rising faster than GDP the last ten years and a declining population, we question how long that path can be maintained. *Additional information sources: Bloomberg, Financial Times, JP Morgan, Reuters, SouthBay Research, Wall Street Journal and Zerohedge.